The Gay and Lesbian Review, Jul.-Aug., 2013. (PDF). 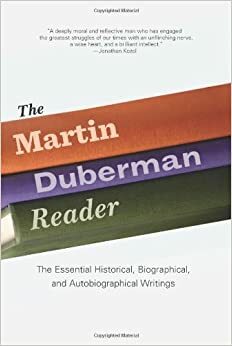 THIS COMPENDIUM of Martin Duberman’s published writings has funneled into a single volume samples from an œuvre that includes some twenty books and numerous essays written over a period of some fifty years. The result of this distillation is a volume of 26 essays described in the book’s subtitle as “the essential historical, biographical, and autobiographical writings” of the author. Duberman is currently a retired history professor who taught at Yale, Princeton, and, after 1971, the City University of New York. About two-thirds of the book are essays on historical topics, usually concerning social movements, activism, and radical politics. There are analytical pieces on the antislavery movement, student rebels, black power, and the American radical tradition; an account of the experimental Black Mountain College written with an investigative tone; and excerpts from his celebrated biographies of Paul Robeson, Lincoln Kirstein, and Howard Zinn. GLBT history is especially well documented by a selection of essays on historical moments, people, and trends. Excerpts from Duberman’s three memoirs find him coming to terms with his sexuality and his multifaceted engagement with the gay world. In the 1970s, he was involved in the momentum of the early GLBT movement, and he documents his engagement in the nascent National Gay Task Force and the Gay Academic Union. The book conveys the impression that in-house factions were standard fare in the movement at this time. Take the falling out between activists Barbara Deming and David McReynolds—“longtime friends and political allies” in the 1970s—following the emergence of feminism as a fault line in the GLBT movement. Deming thought McReynolds was not committed enough to feminism, while McReynolds considered Deming a separatist who imposed her own agenda. The result, as Duberman recounts, was a rupture in both political association and friendship. A high-water mark was the founding of the Center for Lesbian and Gay Studies (clags) at CUNY, the nation’s first program of its kind and Duberman’s brainchild. The narrative here is rendered even more personal through entries from his diaries. The project’s detractors, we learn, came from within the ad hoc committee of gay academics that Duberman convened in 1986 to promote the idea. At the time, he was able to enlist the support of Yale President Benno Schmidt for launching the project at Yale, Duberman’s alma mater. However, Yale gay historian John Boswell, a member of the committee, had different ideas and was “prepared not only to resign from the center, but to destroy it.” That ended the connection with Yale and opened the way for CUNY. After five years of fundraising efforts, in 1991 clags opened with Duberman as its director, a position he maintained for a decade. A standout essay is Duberman’s “Donald Webster Cory: Father of the Homophile Movement,” which was published in these pages (Fall 1997 issue) and appears to be the only unabridged piece in the book. Edward Sagarin, a married Jewish New Yorker without academic education, published in 1951, under the pseudonym Donald Webster Cory, a book called The Homosexual in America, “the first full-scale nonfiction account of gay life in the United States.” Sagarin and his alter ego Cory would travel in two paths. As Cory, he published books, contributed to a gay paper, delivered lectures, and was involved in the New York chapter of the Mattachine Society. As Sagarin, he attended college, climbed the academic echelons, wrote a dissertation about the Mattachine Society, and became a sociology professor specializing in minority groups. But the duplicity couldn’t last, and in 1974 the real Sagarin was outed by a colleague at a sociology conference after Sagarin had spoken out against the practice of “coming out” for homosexuals. The last group of articles, under the heading “Politics and Activism,” develops Duberman’s conviction that the movement should subscribe to a wide, general agenda of social causes. He frequently highlights his commitment to liberationist politics and his doubts about the assimilationist tendencies of the GLBT movement. Duberman is a fine writer, at ease in a variety of genres. Indeed he is also the author of works of fiction and plays, which are not represented here. Inevitably, the book suffers the fate of all collections that try to squeeze an entire œuvre between two covers. Also, the book lacks a few basic items, such as an index, a systematic bibliography, and an introduction explaining how the selections were chosen and organized by the editors. No article was written especially for the book, never mind an interpretive essay. A telegraphic Author’s Note informs us that all footnotes from the originals were omitted—perhaps a reasonable decision, but one that comes with a cost. Whatever light these essays cast on GLBT history, this book seen as a whole casts light on Duberman himself. Indeed, he is the kind of man that historian Duberman would write about. Yoav Sivan is an Israeli journalist and a freelance writer based in New York City. ← Prev Book Reviews ItemReview of Declaring His Genius: Oscar Wilde in North America by Roy Morris, Jr.